We’ve been doing a lot of hard work lately. Let’s take a break and think about a fun example from chemistry! Then suppose you remove one hydrogen. The result is a positively charged ion, or ‘cation’. When I was a kid, I thought the opposite of a cation should be called a ‘dogion’. Alas, it’s not. 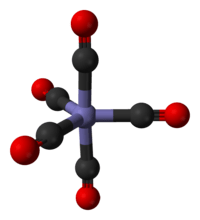 The red vertices come from arrangements where the first carbon has 2 hydrogens attached to it, and the blue vertices come from those where the second carbon has 2 hydrogens attached to it. So, each edge goes between a red vertex and a blue vertex. This graph has 20 vertices, which are arrangements or ‘states’ of the ethyl cation. It has 30 edges, which are hops or ‘transitions’. Let’s see why those numbers are right. First I need to explain the rules of the game. The rules say that the 2 carbon atoms are distinguishable: there’s a ‘first’ one and a ‘second’ one. The 5 hydrogen atoms are also distinguishable. But, all we care about is which carbon atom each hydrogen is bonded to: we don’t care about further details of its location. And we require that 2 of the hydrogens are bonded to one carbon, and 3 to the other. If you’re a physicist, you may wonder why the rules work this way: after all, at a fundamental level, identical particles aren’t really distinguishable. I’m afraid I can’t give a fully convincing explanation right now: I’m just reporting the rules as they were told to me! choices of which two hydrogens are attached to it. This gives a total of 2 × 10 = 20 states. These are the vertices of our graph: 10 red and 10 blue. The edges of the graph are transitions between states. Any hydrogen in the group of 3 can hop over to the group of 2. There are 3 choices for which hydrogen atom makes the jump. So, starting from any vertex in the graph there are 3 edges. This means there are edges. Why divide by 2? Because each edge touches 2 vertices. We have to avoid double-counting them. • A. T. Balaban, D. Fǎrcaşiu and R. Bǎnicǎ, Graphs of multiple 1,2-shifts in carbonium ions and related systems, Rev. Roum. Chim. 11 (1966), 1205. This paper is famous because it was the first to use graphs in chemistry to describe molecular transitions, as opposed to using them as pictures of molecules! Later I’ll say why it’s called this. 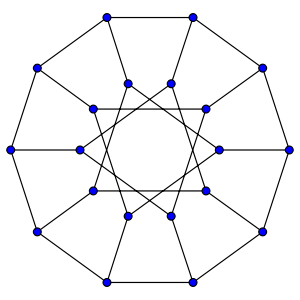 The reason why we can draw such pretty pictures is that the Desargues graph is very symmetrical. Clearly any permutation of the 5 hydrogens acts as a symmetry of the graph, and so does any permutation of the 2 carbons. This gives a symmetry group , which has elements. And in fact this turns out to be the full symmetry group of the Desargues graph. • Milan Randic, Symmetry properties of graphs of interest in chemistry: II: Desargues-Levi graph, Int. Jour. Quantum Chem. 15 (1997), 663-682. We can try to describe the ethyl cation using probability theory. If at any moment its state corresponds to some vertex of the Desargues graph, and it hops randomly along edges as time goes by, it will trace out a random walk on the Desargues graph. This is a nice example of a Markov process! We could also try to describe the ethyl cation using quantum mechanics. Then, instead of having a probability of hopping along an edge, it has an amplitude of doing so. But as we’ve seen, a lot of similar math will still apply. It should be fun to compare the two approaches. But I bet you’re wondering which approach is correct. This is a somewhat tricky question, at least for me. 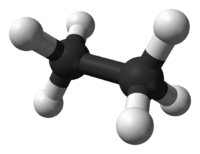 The answer would seem to depend on how much the ethyl cation is interacting with its environment—for example, bouncing off other molecules. When a system is interacting a lot with its environment, a probabilistic approach seems to be more appropriate. The relevant buzzword is ‘environmentally induced decoherence’. However, there’s something much more basic I have tell you about. • Stephen Bacharach, Ethyl cation, Computational Organic Chemistry. So, if we stubbornly insist on applying the Desargues graph to realistic chemistry, we need to find some other molecule to apply it to. It’s a colorless solid, but as you might expect, it’s pretty nasty stuff: it’s not flammable, but it reacts with water or heat to produce toxic chemicals like hydrogen chloride. You can make this stuff by letting powdered iron react with carbon monoxide. It’s a straw-colored liquid with a pungent smell! And the molecule has 20 states… but only if count the states a certain way. We have to treat all 5 ligands as distinguishable, but think of two arrangements of them as the same if we can rotate one to get the other. The trigonal bipyramid has a rotational symmetry group with 6 elements. So, there are 5! / 6 = 20 states. If you look very carefully, you’ll see what’s going on. First the 2 axial ligands move towards each other to become equatorial. Now the equatorial ones are no longer in the horizontal plane: they’re in the plane facing us! Then 2 of the 3 equatorial ones swing out to become axial. This fancy dance is called the Berry pseudorotation mechanism. To get from one state to another this way, we have to pick 2 of the 3 equatorial ligands to swing out and become axial. There are 3 choices here. So, if we draw a graph with states as vertices and transitions as edges, it will have 20 vertices and 20 × 3 / 2 = 30 edges. That sounds suspiciously like the Desargues graph! Puzzle 1. Show that the graph with states of a trigonal bipyramidal molecule as vertices and pseudorotations as edges is indeed the Desargues graph. • Paul C. Lauterbur and Fausto Ramirez, Pseudorotation in trigonal-bipyramidal molecules, J. Am. Chem. Soc. 90 (1968), 6722–6726. and I’ll use this picture to help us think about the Desargues graph. That’s okay: everything we’ll figure out can easily be translated to apply to the real-world situation of a trigonal bipyramidal molecule. The virtue of math is that when two situations are ‘mathematically the same’, or ‘isomorphic’, we can talk about either one, and the results automatically apply to the other. This is true even if the one we talk about doesn’t actually exist in the real world! This entry was posted on Saturday, October 15th, 2011 at 3:12 am and is filed under chemistry, mathematics, networks. You can follow any responses to this entry through the RSS 2.0 feed. You can leave a response, or trackback from your own site. And why are the ligands treated as distinguishable? Does somebody paint numbers on them? Surely one chlorine atom is indistinguishable from another, and these should be treated as identical particles. Yeah, I raised the same issue for the ethyl cation. I haven’t been able to find out if chemists actually do take treat the atomic nuclei as indistinguishable particles in numerical simulations of molecules this size, and how much of a difference it actually makes. They talk about the Desargues graph, but I haven’t seen them discuss this issue. If the chlorines have enough internal degrees of freedom (all those electrons) and they’re interacting with enough other stuff in a hot and messy environment, like some phosphorus pentachloride in liquid form, it’s possible that symmetrizing (or antisymmetrizing) the wavefunction with respect to the chlorine nuclei has a pretty negligible. Here’s a puzzle for beginners (not you) who are interested in this issue. 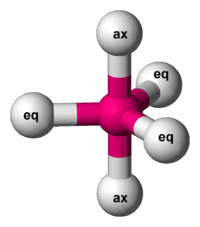 In actual water, the two lone protons in the H2O are indistinguishable fermions, so we should antisymmetrize the wavefunction with respect to interchanging them. But we can imagine a world where there were two different particles with the same mass and charge as a proton—say, a proton and a ‘schmoton’. Then we could make a chemical called ‘pseudowater’, where instead of using two protons for the H’s in our H2O, we used a proton and a schmoton. Then we would not antisymmetrize the wavefunction with respect to interchanging them. Puzzle 2. What would be the easiest way to tell the difference between a molecule of water and a molecule of pseudowater, experimentally? Of course we actually can make water using one ordinary hydrogen atom and one deuterium atom. This is called semiheavy water. And here again, we don’t antisymmetrize the wavefunction. But it’s easy to tell the difference between semiheavy water and ordinary water, either by weighing it or noticing that it melts and boils at a lower temperature than ordinary water. So, I need to invent ‘pseudowater’ to make my question more interesting. Digressing somewhat: in the liquid state, molecules of water trade protons with each other quite often. So, liquid semiheavy water is not stable: it rapidly turns into a mixture of 25% ordinary water, 25% heavy water and 50% semiheavy water. The same thing would happen with pseudowater. This complicates my question a bit more than I want, which is why I spoke of ‘a molecule of pseudowater’ instead of a liter of pseudowater. But in a low-density gas, I think water molecules don’t trade their protons so quickly. Digressing further, I just discovered that rats can taste the difference between ordinary water and heavy water! Abstract: Substitution of deuterium oxide (D2O) as the solvent in taste stimuli elicits neural responses which differ from ordinary water (H2O). Previous reports have shown that D2O is toxic to many animals and rats avoid drinking it when offered H2O simultaneously. In the current study, summated responses were recorded from the chorda tympani nerves of rats after NaCl, KCl, sucrose and quinine were applied to the tongue in solutions of either D2O or H2O. Both solvents were used as the adapting or rinse solution in separate series. On tongues adapted to H2, D2O elicited mean responses which were equivalent to 29% of the response to 0.1 M NaCl. The threshold concentration of D2O in H2O was between 25% and 50%. Solutes in D2O yielded responses which were greater than corresponding solutions of H2O when adapting rinse was H2O. Adaptation to D2O diminished the responses to D2O solutions of NaCl, KCl and sucrose but not quinine. This observation suggests that some portion of the augmented response to stimuli in D2O is due to the solvent itself. The taste of water has been examined by both electrophysiological methods and by behavior, but none of the mechanisms espoused for its effect seem adequate to explain the response to D2O. Water structure at the interface between molecular components of the cell membrane and the bulk phase of the surrounding medium is considered as a locus for disparity in the taste responses to D2O and H2O in the rat. I don’t know if people can taste the difference between ordinary water and heavy water. I supposed I’d have heard it if they could. But maybe only special people, like trained wine tasters, can do it? As a protein NMR spectroscopist by trade, I deal with isotopically substituted organisms on a regular basis. It seems that single-celled microorganisms tolerate 100% heavy water substitution. However, to achieve near 100% substitution of protium with deuterium in all cellular metabolites and macromolecules, a perdeuterated carbon source is needed. For protein NMR sample preparations, it is routine to completely substitute at least one of major elements in the molecule (commonly N or C) with a heavier isotope 15N or 13C. This is done by producing proteins biosynthetically in E. coli cultures, grown in chemically defined media that contain isotopically substituted compounds: 99% – 15N ammonium salts as sole nitrogen source and 99% – 13C glucose as sole carbon source. Occasionally, 15N , 13C and 2H substituted samples are prepared (I’ve done this myself) by using 99.9% D2O as solvent for medium, and 13C,2H-glucose as a sole carbon source. E. coli grow slowly in D2O compared to H2O, but they do grow. I was told that ~98% of 1H is substituted with 2H in samples produced this way. Now, bacteria are among simpler forms of life. Eukaryotic organisms, such as yeast and algae, can also grow in 99% D2O (again, used in production of isotopically labeled samples for NMR). While complete substitution with heavy water is fatal to higher organisms and their cell cultures, it seems that amino acids completely substituted with 15N and (or) 13C are tolerated well enough in animal cell cultures. And apparently mass-spectroscopists produce living rats with 15N substitution, by using algal feedstock with >98% 15N. These are meant to study cellular protein composition and modifications under pathological versus normal conditions, so presumably (I do not know how rigorously has this been tested) rats suffer no ill effects from the isotopic substitution itself. I do not know how much of this is news to you, and certainly none of the above contradicts your statement that for present terrestrial biosphere substitution with heavy water would not be a simple matter, but I hope you found it somewhat interesting. Good luck with upcoming “Orthogonal” books. The short answer is that for nuclei heavier than H, there is very little impact from nuclear exchange for molecular structure calculations. In fact, there is relatively little impact from assuming that nuclei are classical! The idea is that the nuclei, being so much more massive than the electrons, are sharply peaked about classical positions (at least at the temperatures relevant to chemistry). 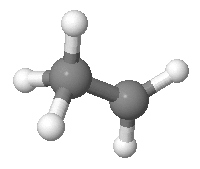 For many of the things that chemists care about, It turns out this classical nuclei approximation is really good. At room temperature, the thermal wavelength of a proton is about 0.4 Angstrom, a good bit smaller than internuclear distances in a stable molecule. • Brian Sutcliffe, Permutational symmetry and molecular structure calculations, Collect. Czech. Chem. Commun. 70 (2005), 657-676. • Benjamin Auer and Sharon Hammes-Schiffer, Localized Hartree product treatment of multiple protons in the nuclear-electronic orbital framework, J. Chem. Phys. 132 (2010), 084110. • Bastiaan J. Braams and Joel M. Bowman, Permutationally invariant potential energy surfaces in high dimensionality, International Reviews in Physical Chemistry 8 (2009). What a wonderfully erudite answer, Andrew! Thanks for all those references: I was trying to find some, but I wasn’t having much luck. I’m very relieved that I can study phosphorous pentachloride fairly accurately without (anti)symmetrizing over the chlorine nuclei wavefunctions, because I was going to whether I could or not—I just wanted an excuse to play around with dynamics on the Desargues graph! My ‘water versus pseudowater’ puzzle is surely too easy for you, so I’m glad you didn’t address it directly… I hope some other readers, perhaps less knowledgeable in physical chemistry, take a crack at it! People are posting important comments about how to save the world, so I feel a bit silly posting another one about heavy-water-drinking rats, but I feel it’s good to put all this esoteric information in one place. [György] Hevesy [Hungarian radiochemist and Nobel laureate] helped determine how quickly the human body recycles an average water molecule (nine days) by volunteering to drink special “heavy” water, in which some hydrogen atoms have an extra neutron, and then having his urine weighed each day … [he also] performed heavy-water experiments on goldfish as well as himself, and he ended up killing a number of them. Lewis decided to hitch himself to this no-miss prize by investigating the biological effects of water made with heavy hydrogen. Others had the same idea, but Berkeley’s physics department, headed by Ernest O. Lawrence, happened to have the world’s largest supply of heavy water, quite by accident. The team had a tank of water it had been using for years in radioactivity experiments, and the tank had a relatively high concentration of heavy water (a few ounces). Lewis begged Lawrence to let him purify the heavy water, and Lawrence agreed – on the condition that Lewis give it back alter his experiments, since it might prove important in Lawrence’s research, too. Lewis broke his promise. After isolating the heavy water, he decided to give it to a mouse and see what happened. One queer effect of heavy water is that, like ocean water, the more you drink, the more throat-scratchingly thirsty you feel, since the body cannot metabolize it. Hevesy ingested heavy water in trace amounts, so his body really didn’t notice, but Lewis’s mouse gulped all the heavy water in a few hours and ended up dead. Killing a mouse was hardly a Nobel Prize-worthy exercise, and Lawrence went apoplectic when he learned a lousy rodent had peed away all his precious heavy water. Your comment that it’s tricky to know whether to apply stochastic or quantum mechanics raises an interesting question: what are the equations that smoothly transition between the two based on the level of external noise? Is it possible to write these down in a universal way that isn’t too dependent on the type of noise, or would a different level of noise be required for each state? 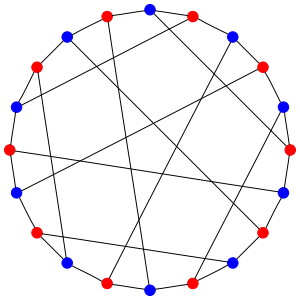 if we seek a solution that’s compatible with all 240 symmetries of the Desargues graph, it’s almost unique. The symmetries constrain the problem enormously! I’d been planning to talk next time about the classical and quantum versions of this problem, but I could also talk about the almost unique way of interpolating between the classical and quantum cases. And if I do, you’ll see this particular way of interpolating works pretty generally. But I don’t know how physically reasonable it is, in general. I’d be interested in knowing the answer to Geoffrey Irving’s question. I’ve been interested in a certain generalization: for any graph, one can define a Markov process; for any graph, you can replace that by a quantum process. Briefly, the edges, instead of being probabilities of transition, become unitary matrices. The verticies are then points in projective spaces (i.e. point in the space on which U(n) acts). So, for example, a one may define a “quantum finite automata” by applying the above steps to a normal probabilistic finite automata. (see wikipedia for details). Likewise, given any symmetric space, and a collection of symmetries that act on it, you can generalize Markov by making the points of the graph be elements in the symmetric space, and the edges be valued among the symmetries. I’d be interested in knowing the answer to Geoffrey Irving’s question. I’ve been interested in a certain generalization: for any graph, one can define a Markov process; for any graph, you can replace that by a quantum process. Briefly, the edges, instead of being probabilities of transition, become unitary matrices. I plan to talk about these things, at least a little. It actually sounds like you mean ‘Markov chain’ rather than ‘Markov process’ here. A Markov chain occurs in discrete time while a Markov process occurs in continuous time. So, to specify a Markov chain we give a transition probability for each pair of states, while to specify a Markov process we give a ‘probabilistic rate of transition’ for each pair of states. For a Markov chain the matrix of transition probabilities is a stochastic matrix, while for a Markov process the matrix of rates is an infinitesimal stochastic matrix, also known as an ‘intensity matrix’. All these concepts were explained more clearly than I’m doing it now back in Part 11. And, they all have quantum analogues, as explained in Part 12. Don’t feel bad: I’m happy to review things. That’s the only way to keep new people jumping on board. I don’t want what I’m doing to only be comprehensible to people who have been following all along! Anyway, from a graph we can get 4 things in a completely natural way: a Markov chain, a Markov process, and the quantum analogues of those two. We can also get a 1-parameter family of continuous-time dynamical systems interpolating between the Markov process and its quantum analogue. I haven’t thought about trying to doing that in the discrete-time case. I’m beginning to see what I should talk about in my next post(s)! Thanks! Puzzle 2. Suppose there were a substance called ‘pseudowater’, exactly like ordinary H2O except that the Pauli exclusion principle didn’t apply to the nuclei of the two hydrogen atoms. What would be the easiest way to tell the difference between water and pseudowater? Interesting. Are you talking about spin isomers? I would expect a measurable mass difference between the two spin isoforms. Hi, Walter – hope all’s well! You got it. If I were talking about H2 instead of H2O, that article you linked to on spin isomers of hydrogen would be exactly right. But—for no particularly good reason—my question was about H2O. In fact, I got a bit mixed up… it turns out I understand the answer for H2 a lot better than the answer for H2O. So let me see if I can explain it for H2. Since the two protons are identical fermions, the wavefunction of the hydrogen molecule has to change sign when you switch them. 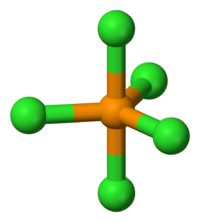 In orthohydrogen the protons’ spin state is symmetric: it doesn’t change when you switch them. So their position state must change sign when you switch them. This means that their total orbital angular momentum can’t be 0: if it were, it would be invariant under rotations, so it wouldn’t change sign when you switch the two protons! But it can be 1, or in fact any odd integer. So, it’s antisymmetric. That means their position state must not change sign when you switch them. That means the the total orbital angular momentum of the protons can be 0, or in fact any even integer. In short, parahydrogen can have total angular momentum zero, but orthohydrogen can’t—it has to be ‘rotating’. This means the ground state of parahydrogen has lower energy. And the energy difference is significant; according to the Wikipedia article divided by Boltzmann’s constant is about 175 kelvin. So for a pseudohydrogen molecule, unlike an ordinary hydrogen molecule, the ground state energy of the para form would equal that of the ortho form. Now, what about water? How would pseudowater differ from water? So nobody is willing to try this puzzle? What a bunch of wimps! I won’t make fun of you if you try to answer it and make a mistake. But I’ll definitely make fun of you if you don’t even try! With precisely 5 minutes this morning for such fun activity as answering Azimuth puzzles, can’t we establish for Puzzle 1 an isomorphism between the states and transitions of the trigonal bipyramidal molecule and those of the ethyl cation? Whether an atom is in the axis of the former corresponds to whether it’s in the pair end of the latter. I’m sorry you’re so busy these days! Anyway, you’ve done more than your share of answering Azimuth puzzles—I think you answered all the Network Theory puzzles until your current state of overwork overtook you. So I would never make fun of you for not trying this one. It’s all the other people who’re in trouble. … can’t we establish for Puzzle 1 an isomorphism between the states and transitions of the trigonal bipyramidal molecule and those of the ethyl cation? That’s indeed the best way to do it. After all, so far I’ve basically defined the Desargues graph to be the graph of states and transitions for the ethyl cation. Sure, I showed you a picture of it too—but it’s hard to do much with that. Whether an atom is in the axis of the former corresponds to whether it’s in the pair end of the latter. If so, the next step would to make sure that this analogy sets up a 1-1 correspondence between the states in the two problems, and also the transitions. Fascinating, I’m considering sending the post to my graph theory students. As for the validity of distinguishing between different identical particles: my approach would be to say that of course you’re allowed to distinguish between them, just as long as you remember the symmetries. One thing I’ve always wondered is when in a given physical situation with such a symmetry, which is the right quotient? The usual one, or the homotopy one? Let’s say the symmetry is finite, indeed it could be just a single reflection. Can one ever see the homology of in a physical system? Another question I have is about the construction of these graphs. Why have we stopped at edges? Could there be 2-cells? … I’m considering sending the post to my graph theory students. The Desargues-Levi is the ‘bipartite double cover’ of the Petersen graph, formed by replacing each Petersen graph vertex by a pair of vertices and each Petersen graph edge by a pair of crossed edges. I think I used to know how you could get the Petersen graph directly from thinking about the ethyl cation. Maybe just treat the two carbons as indistinguishable? As for the validity of distinguishing between different identical particles: my approach would be to say that of course you’re allowed to distinguish between them, just as long as you remember the symmetries. Well, Distler’s point was that the Hilbert space of quantum states of phosphorus pentachloride (for example) is smaller than I made it sound. One thing I’ve always wondered is when in a given physical situation with such a symmetry, which is the right quotient? The usual one, or the homotopy one? People mainly discuss this issue in the treatment of ‘gauge’ symmetries in classical field theory. The traditional approach was to take the usual quotient, but it’s starting to seem that the homotopy quotient is right. A good example is whether you should use the moduli space of elliptic curves when studying about strings whose worldsheet has genus 1, or the moduli stack. The moduli space is an ordinary quotient, while the moduli stack is a homotopy quotient. As I explained back in “week125” of This Week’s Finds, the Picard group of the moduli stack of elliptic curves is , and this is related to the magic role of the numbers 12 and 24 in this theory—for example, how the vacuum energy is -1/24, which is part of why the theory is only consistent in 24 + 2 = 26 dimensions. Heh. I’m not doing the n-category schtick anymore. But if we were studying something like a 2d random field theory, instead of a Markov process or Markov chain (where there’s just 1 dimension, namely time), that could be natural. Thank you for the thorough reply, I’ll need a little time to digest all that. As for the 2-cells, I was more influenced by group (co)homology than n-category theory. Essentially the idea in my head was that if it were possible to move two hydrogens at once, then there may be a 2-cell whose boundary records the equivalence between the moves which move only one hydrogen at once. The simplest example I can come up with is cyclopropane (C3H6, a triangle of carbon molecules) with two hydrogens removed, although I have no idea how stable this would be! I think the graph would have 54 vertices and 144 edges and an action of . The 2-cells depend on the model of how hydrogens are allowed to move, but assuming they’re only allowed to skip over the bonds (rather than over the centre of the triangle) then there are are number of squares attached, perhaps 24.